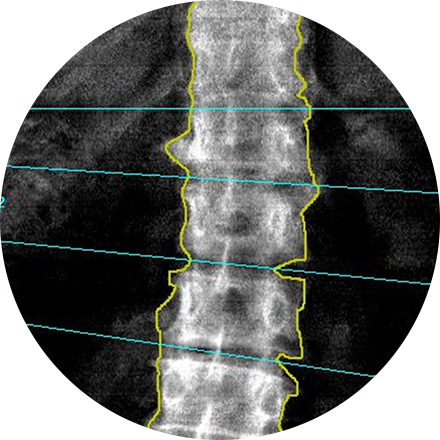 What is Bone Density Scan? Osteoporosis resulting in bone fractures is responsible for thousands of injuries in the elderly that require long-term care confinement. Osteoporosis, or bone loss, is commonly associated with post-menopausal women. However, it can also affect men. Therefore, it is important for everyone with risk factors—such as being post-menopausal without estrogen supplementation, patients who are smoking or have smoked, and those individuals taking certain medications such as Prednisone or other steroids, and other factors—to have a DEXA scan. The 30-minute procedure is simple and painless. Depending on whether your hip, spine, or wrist is being scanned, you will either lie on a table or sit in a chair. You may lie with your legs straight or with your lower legs resting on a platform to elevate them slightly. You will be able to communicate with the technician during the procedure. A DEXA scan is painless and non-invasive, with very little exposure to radiation—less than one-tenth of what is used in a chest X-ray. At our facilities, we have DEXA scanning equipment with the latest software for the most accurate diagnosis. This enhanced form of X-ray is more accurate than a plain X-ray test and provides the only way to accurately diagnose and monitor a patient with significant bone loss. This test is a valuable tool for diagnosing osteoporosis, which often has no symptoms until you suffer a fracture. A bone density scan can diagnose the disease at its earliest stages, which means you can begin receiving treatment to protect your bones sooner.